Pink, pink and oh some more pink! Ari by Ariana Grande You know my love for this by now, but I shall tell you some more. I am obsessed with this sweet girly scent. I am forever spraying the perfume onto me or the hair mist or the rollerball. Literally one of each is at every corner of my room, so theres always one at hands reach. The bottle is also the most adorable thing I've ever laid my eyes on and I can't get enough of featuring it in my photos! Find a full review all about it here. Rapunzel Phone Case Since getting this phone case i've actually gotten another one through my letter box. However I adore this one. The glitter and stars move around inside and I just adore the illustration. I found this on eBay and paid less than €4.00 for it. You really have to appreciate eBay and it's many bargains. In my opinion this case is going to be perfect for Spring time. Wet n Wild Mono Shadow in Cheeky Since discovering this shadow I just cannot get enough of it. I wear it with the Pink Gold Maybelline Colour Tattoo under it and it just gives the shadow such a gorgeous shine and helps bring out the colour. I've been wearing it non stop lately and have fallen in love with the formula. The shadow is so lovely to work with, it blends really well and it cost less than €2.00! 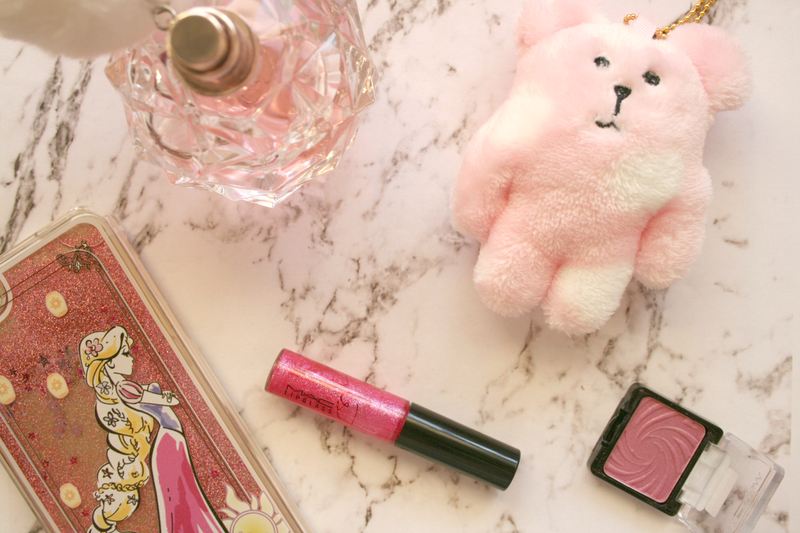 Have you been loving any Pink coloured products lately? Really really REALLY love the look of that lipgloss! So perfect for summer. Love this blog post idea!I collect pink lipsticks I have so many! love Mac Miley's lip glass!